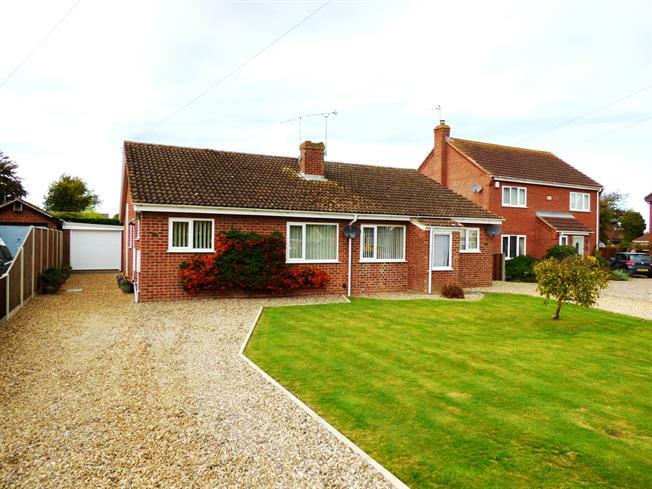 2 Bedroom Semi Detached Bungalow For Sale in Norwich for Offers in excess of £180,000. A beautifully presented two bedroom bungalow in easy reach of the city enjoying a village setting. Lingwood is an active village with a welcoming, friendly community. There are several public houses close by, a fish and chip shop, a general store, Post Office and primary school. Only a five minute drive away is the A47 giving easy access to the historic city of Norwich one way, and Great Yarmouth the other with nine miles of golden beaches. Lingwood also has a railway station and regular bus service with the broads also being on the doorstep. This semi-detached two bedroom bungalow is in beautiful order throughout with the vendor having refitted the kitchen and bathroom. Set back from the road in a cul-de-sac location there is plenty of parking and a detached garage. Internally, the property has a large lounge/diner with wall mounted fire and picture window overlooking the front lawn. The two bedrooms are of a good size and enjoy views out on to the enclosed rear garden which is set for easy maintenance and offers a high degree of seclusion.